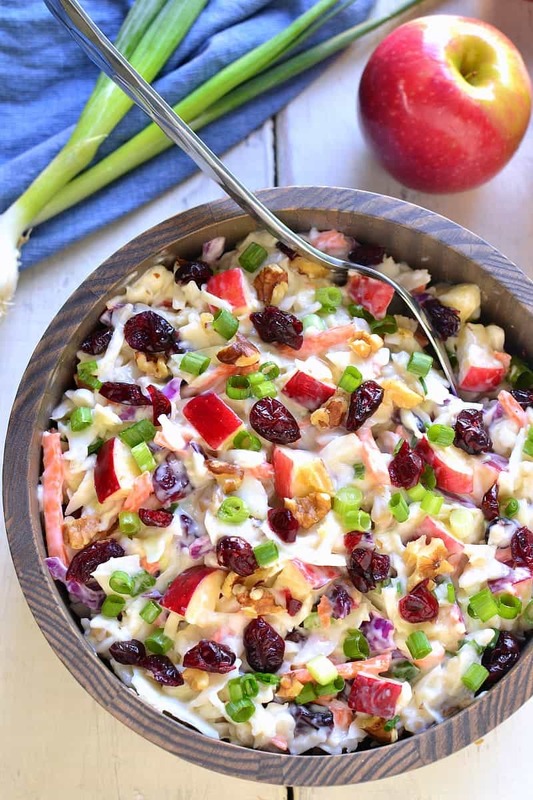 Apple Cranberry Coleslaw is the perfect way to mix things up for fall! 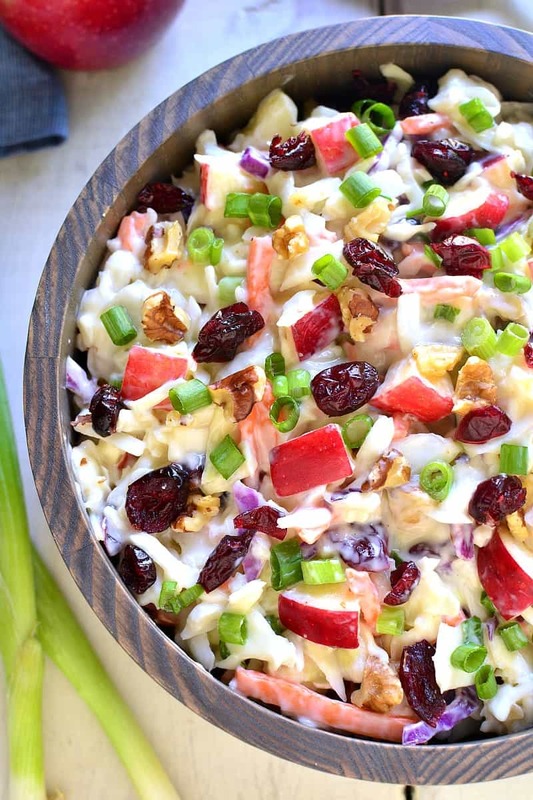 Loaded with fresh apples, dried cranberries, chopped walnuts, and green onions, this coleslaw is crunchy, sweet, and so delicious! So today’s the first day of school. And three of mine are going! We have a 5th grader, a 3rd grader, and a kindergartener this year….which means it’s just Myla and me left at home. SUCH a strange feeling. I’ve been waiting for this day for a while now (if you’ve been following me I’m sure you know that) but now that it’s here, I have to admit….I’m not exactly sure what to do with it! It doesn’t help that Nora got on the bus *literally* kicking and screaming, which leaves me worried about her day in general. And it doesn’t help that we missed “meet & greet” last night, which would have been a key time to make her feel more comfortable about the whole school thing. But alas, it is what it is. Nora needs to start school and work through her fears. Greta needs to face her friendship concerns and learn to stand up for herself. And Ellia? Well, I’m not too worried about Ellia. She seems to have a great first day every year. So now the question is: how are Myla and I going to spend our days!? I’m envisioning some reading, some playing, some going to the park, and….soon….some fun fall activities! Like pumpkin farms and apple picking! 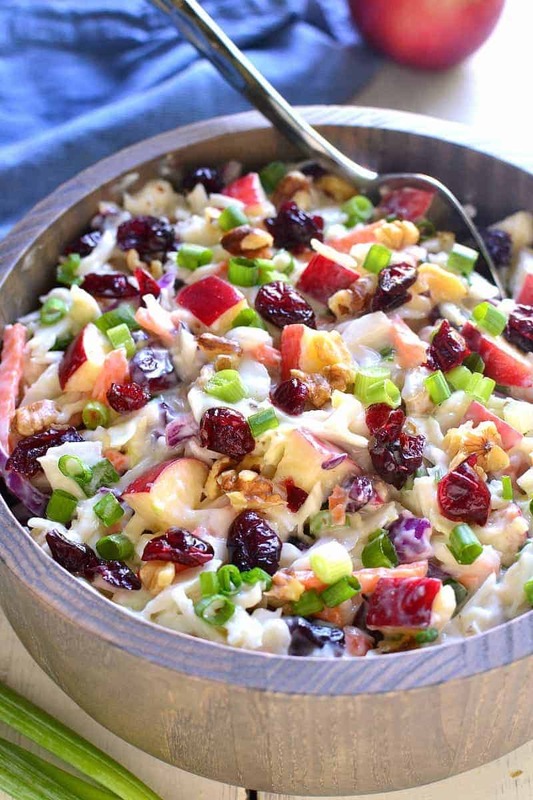 Which will make for some delicious Apple Cranberry Coleslaw. 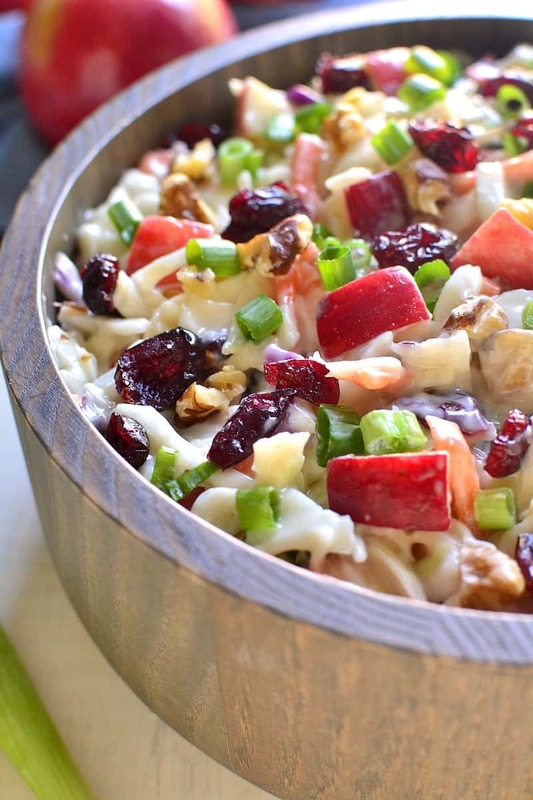 You know me and my love of salads….and just because summer is coming to an end doesn’t mean that salad season is over! 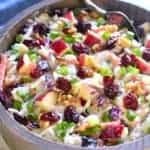 I love how this coleslaw combines a summer classic with two fall flavors – apples and cranberries – for a quick and easy side dish that moves us right from one season to the next. I see myself making this for Labor Day, fall cookouts, football games, and even holidays. It’s fresh, it’s seasonal, and with all the different colors, I love how bright and beautiful it is! 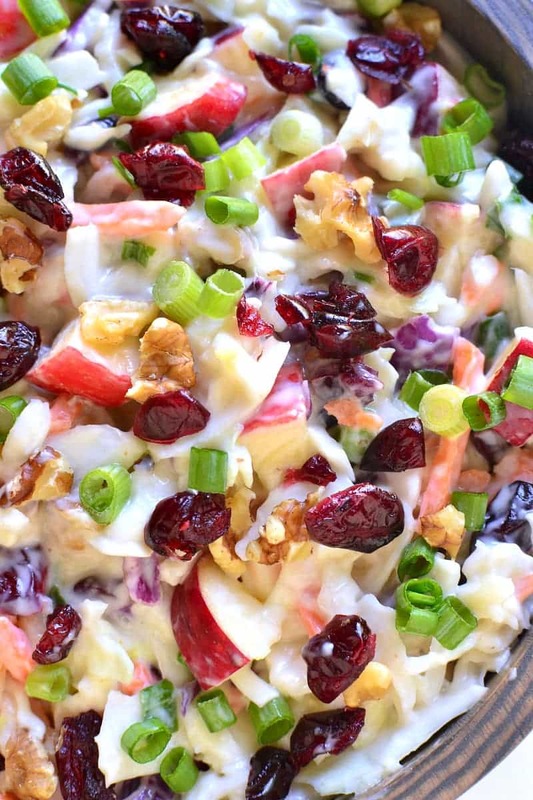 Apple Cranberry Coleslaw for the win! Now here’s hoping the first day of school is a win, too. Combine coleslaw ingredients in a large bowl. 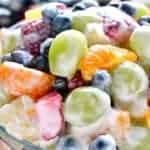 In a small bowl, combine dressing ingredients and mix well. Pour dressing over coleslaw and stir until evenly coated. 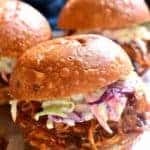 *For a less creamy coleslaw, use 1/2 c. mayo, 1/2 c. plain yogurt, 1/4 c. honey, and 1/2 tsp. ginger. I hope their first day went well! And this looks so very delicious. 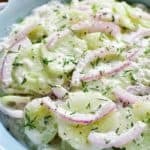 I love the sweet and savory flavors in this coleslaw! So perfect for fall! 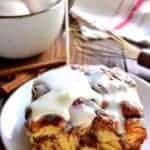 I love this flavor packed fall version of a classic!! I hope the girls had a great first day! My girls started this past Wednesday and I missed them, how certainly was more quiet ! Is coleslaw looks perfect for Labor Day weekend, thank you for sharing!! This is the prettiest coleslaw I think I’ve ever seen. Plus I really love all the textures you’ve added. 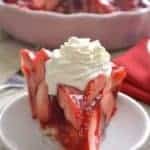 I’m going to make this as soon as I can! What amazing flavors you have in this! I want some today! I hope everyone had a great first day, Cathy. This salad looks absolutely delicious. 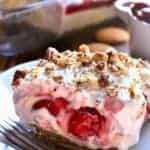 I love all the fresh flavors here and I know my family would love it too. I’m just curious, why “not Greek”?? This looks beautiful! I can’t wait to try it, but plan to play with the dressing, subbing something for the mayo. Anyway, I was just curious about the yogurt. Thank you! (Beautiful pictures…if it tastes half as good as it looks, it will be amazing!). Hi, I was wondering if you tried it with just yogurt instead of mayo? Any tips? Hi Mequila, it would work with just yogurt but the taste would be a little different. You would probably need to add more of the seasonings! 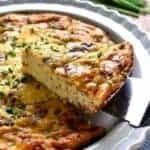 My adult men asked me to keep this recipe; rare request! 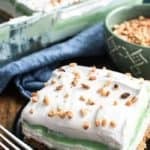 Why not “real Greek” yogurt? Sometimes hard to find! Added 1/2 cup of dried cherries, so very fruit-heavy for Thanksgiving. 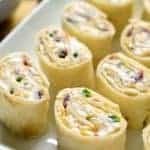 Family raved about this dish! New holiday favorite. Yay! Thanks for the feedback, Debbie! Is the ginger fresh grated? Or do you use that much ginger powder? This looks awful good. I would like to try it but what could I use in place of the honey? There are a zillion kinds of apples in the supermarkets and farmers markets when fall arrives. 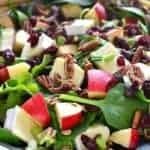 Which apple did you use and will the apples brown if the salad is made and kept in the frige overnight? Thanks for your assistance. Fabulous. Great tasting dressing and very flavourful salad. Definitely a keeper. Looking forward to taking it to a shower.